Audible, the popular audiobook service, has bumped its Windows Phone offering and has launched an exclusive offer for consumers. Should you download and use the apps available for either Windows 8 and Windows Phone 8, create a new account and reside in the US, you'll be eligible for a free audiobook for trying out the service. Pretty neat, eh? It's really easy to redeem the free audiobook. Simply create an account, pick the free book and you're good to go. Here are the titles that are on offer: The Power Trip by Jackie Collins, American Sniper by Chris Kyle, and F. Scott Fitzgerald’s classic The Great Gatsby. Once the book is downloaded, it will be displayed in the library and will be available across all Audible apps connected to that account. Be sure to hurry if interested as the offer ends May 13th. Note that as stated above, this offer is only covering new registrations through the Windows 8 and Windows Phone 8 (and presumably Windows Phone 7.x) apps. As for what's included in the latest version, we're not entirely sure. It could well be a release for the special offer (since there appears to be no change in the version number), but should you notice anything new which we've overlooked be sure to shout out in the comments. 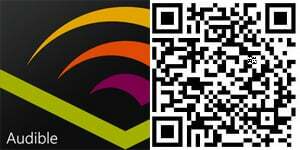 We did previously look at Audible as the app was updated to 1.4 back in November last year. 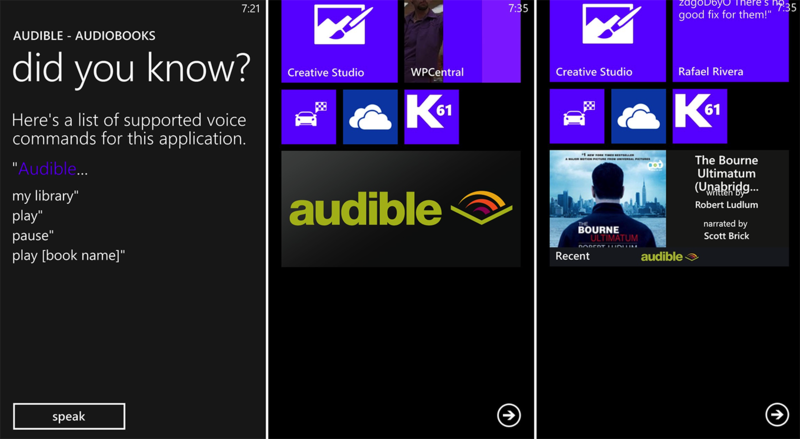 Windows Phone 8 features were included, with Live Tile sizes and voice commands implemented. It's a must-have app for anyone who enjoys cracking open a good book every now and then, and is particularly useful for those boring commutes to and from work each and every day.